§ 61.23 Medical certificates: Requirement and duration. (v) Except for a glider category rating or a balloon class rating, prior to taking a practical test that is performed in an aircraft for a certificate or rating at the recreational, private, commercial, or airline transport pilot certificate level. (8) When taking a test or check for a certificate, rating, or authorization conducted in a flight simulator or flight training device. (c) Operations requiring either a medical certificate or U.S. driver's license. 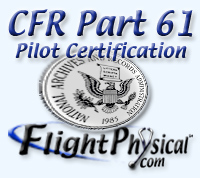 (iii) A flight instructor certificate with a sport pilot rating while acting as pilot in command or serving as a required flight crewmember of a light-sport aircraft other than a glider or balloon. (iv) Not know or have reason to know of any medical condition that would make that person unable to operate a light-sport aircraft in a safe manner. (d) Duration of a medical certificate. (iii) The period specified in paragraph (c)(3) of this section for operations requiring a recreational pilot certificate, a private pilot certificate, a flight instructor certificate (when acting as pilot in command or a required pilot flight crewmember in operations other than glider or balloon), or a student pilot certificate. (ii) The period specified in paragraph (c)(3) of this section for operations requiring a recreational pilot certificate, a private pilot certificate, a flight instructor certificate (when acting as pilot in command or a required pilot flight crewmember in operations other than glider or balloon), or a student pilot certificate. (B) The 24th month after the month of the date of the examination shown on the certificate if the person has reached his or her 40th birthday on or before the date of the examination. Medical certificates: Requirement and duration. [(d) Duration of a medical certificate. (i) A first-class medical certificate. (A) Under age 40 ....... an airline transport pilot certificate .................. 12th month after the month of the date of examination shown on the medical certificate. (B) Age 40 or older .... an airline transport pilot certificate .................. 6th month after the month of the date of examination shown on the medical certificate. (C) Any age ................ a commercial pilot certificate or an air traffic control tower operator certificate. 12th month after the month of the date of examination shown on the medical certificate. (D) Under age 40 ....... a recreational pilot certificate, a private pilot certificate, a flight instructor certificate (when acting as pilot in command or a required pilot flight crewmember in operations other than glider or balloon), a student pilot certificate, or a sport pilot certificate (when not using a U.S. driver’s license as medical qualification). 60th month after the month of the date of examination shown on the medical certificate. as medical qualification). 24th month after the month of the date of examination shown on the medical certificate. medical certificate. (A) Any age ................ a commercial pilot certificate or an air traffic control tower operator certificate. 12th month after the month of the date of examination shown on the medical certificate. (B) Under age 40 ....... a recreational pilot certificate, a private pilot certificate, a flight instructor certificate (when acting as pilot in command or a required pilot flight crewmember in operations other than glider or balloon), a student pilot certificate, or a sport pilot certificate (when not using a U.S. driver’s license as medical qualification). 60th month after the month of the date of examination shown on the medical certificate. (C) Age 40 or older .... a recreational pilot certificate, a private pilot certificate, a flight instructor certificate (when acting as pilot in command or a required pilot flight crewmember in operations other than glider or balloon), a student pilot certificate, or a sport pilot certificate (when not using a U.S. driver’s license as medical qualification). 24th month after the month of the date of exmination shown on the medical certificate. cate (when not using a U.S. driver’s license as medical qualification). 60th month after the month of the date of examination shown on the medical certificate. cate (when not using a U.S. driver’s license as medical qualification). 24th month after the month of the date of examination shown on the medical certificate.